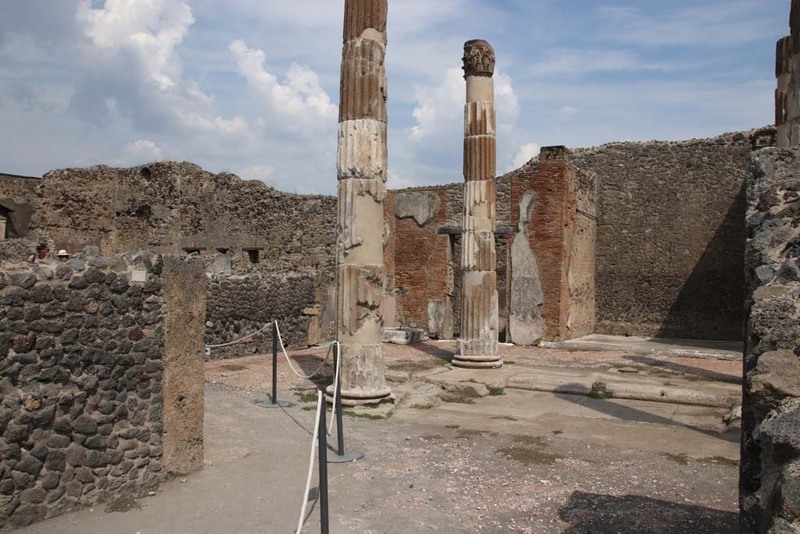 VI.12.5 Pompeii. 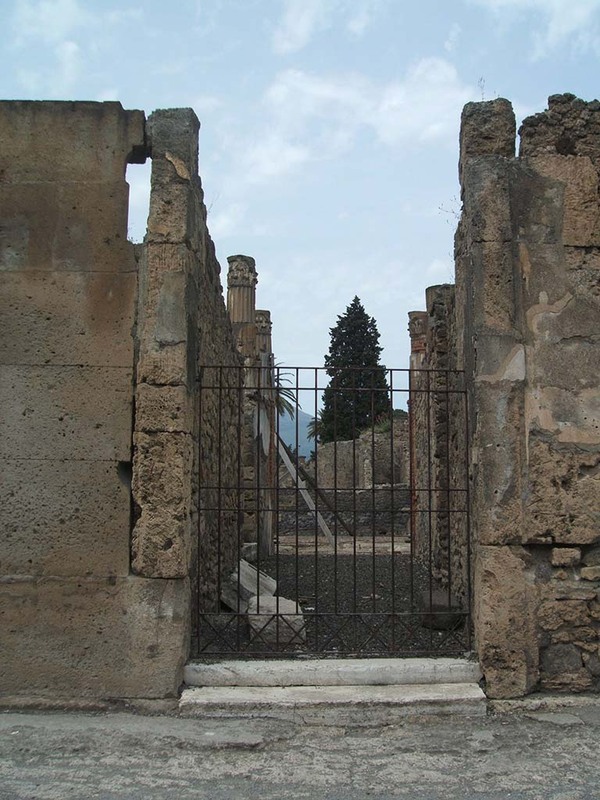 Entrance to Casa del Fauno or House of the Faun. Linked to VI.12.1, VI.12.2, VI.12.3, VI.12.7 and VI.12.8. Excavated 1829 to 1833, 1900, 1930 and 1960. Bombed in 1943. Reconstructed in 1945. (Strada della Fortuna 52). VI.12.5 Pompeii. December 2006. Entrance doorway. VI.12.5 Pompeii. June 2012. 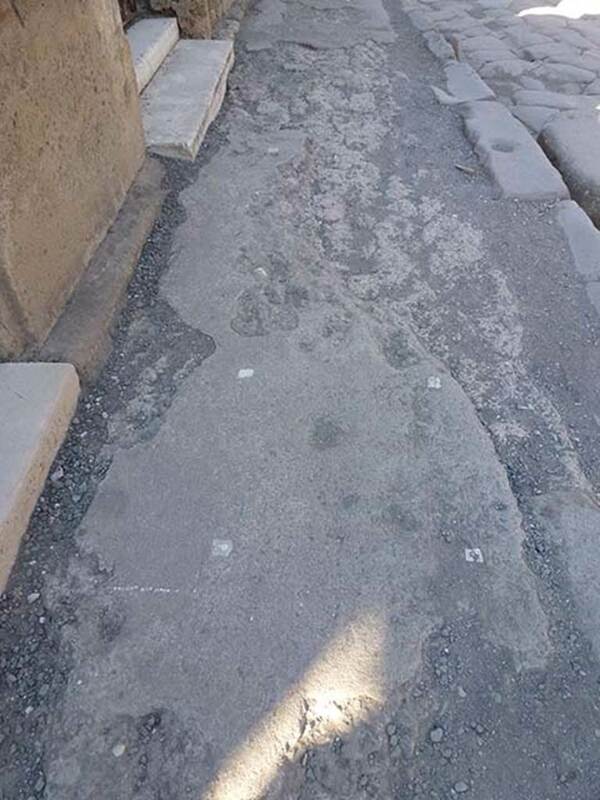 Looking east along pavement outside VI.12.4 and VI.12.5 (top). VI.12.5 Pompeii. December 2006. Looking south across impluvium and atrium to entrance. 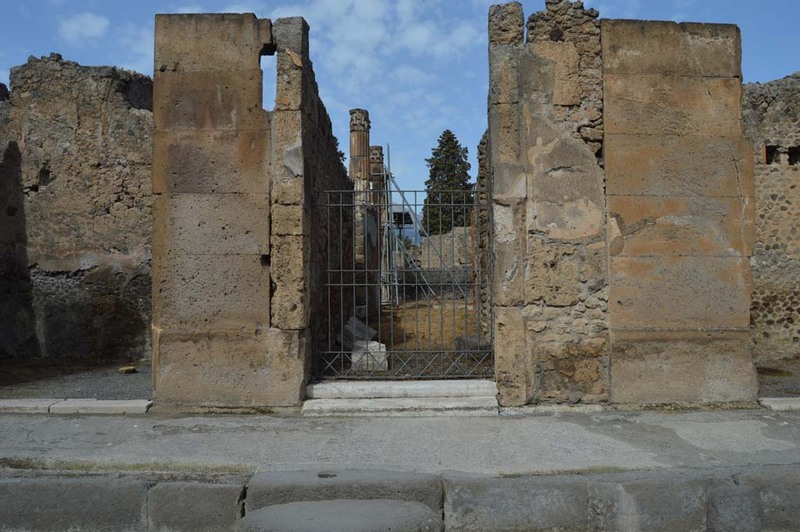 According to Garcia y Garcia, the second of the two bombs to hit the House of the Faun fell on this secondary atrium. 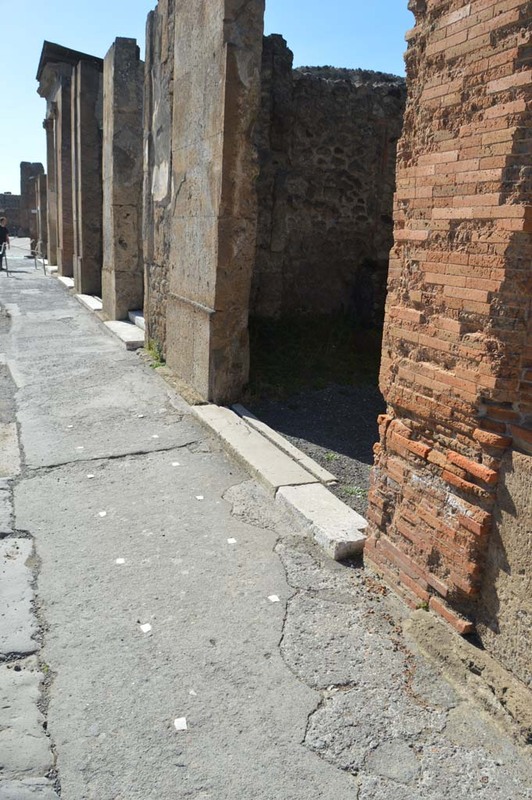 The bomb caused the felling of three of the four columns, the only one remaining was that in the north-east corner. Also destroyed were two rooms in the north-west of the same atrium. 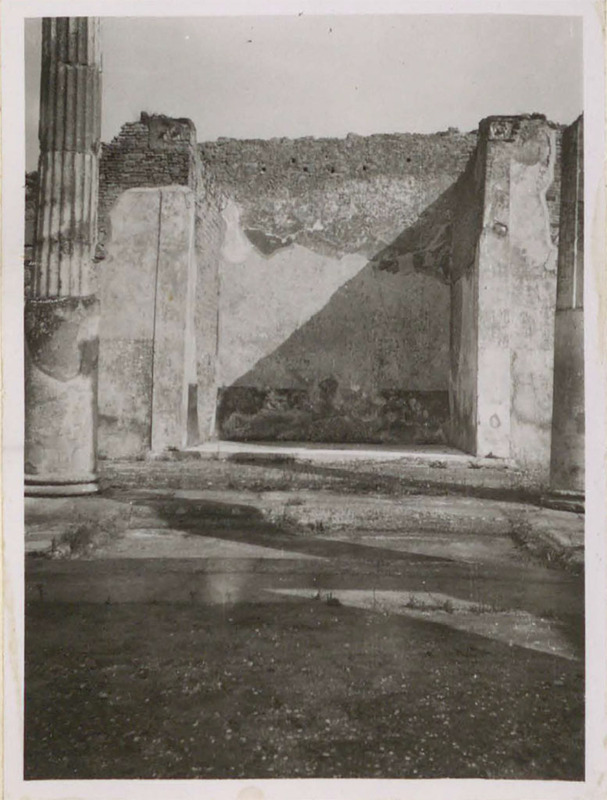 VI.12.5 Pompeii. December 2006. Looking south across atrium to entrance. 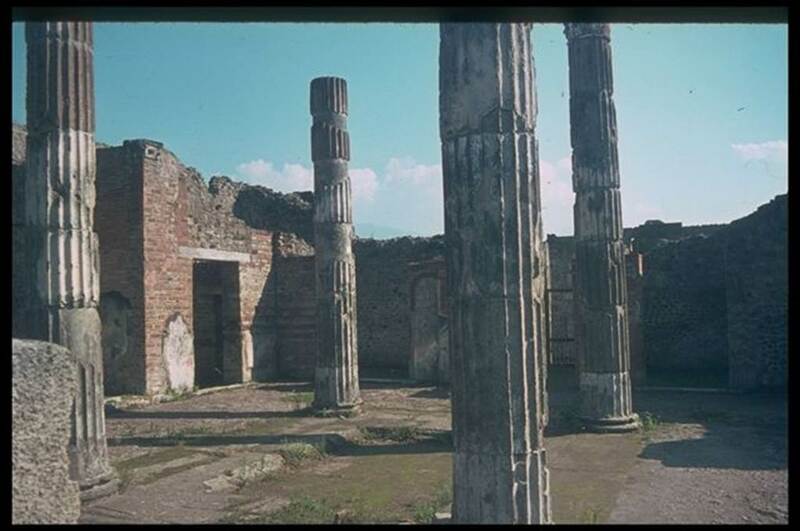 VI.12.5 Pompeii. Atrium, looking south to rooms in south-east corner of atrium. 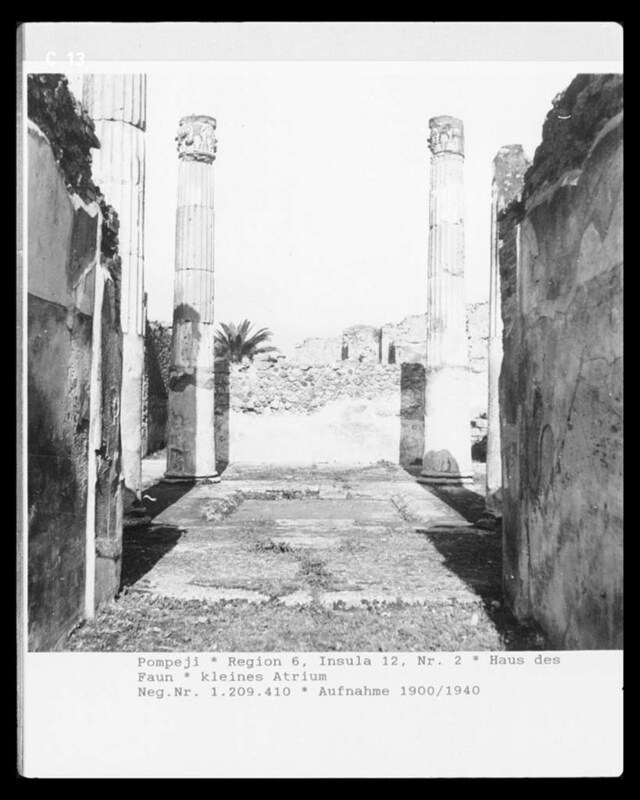 VI.12.5 Pompeii. May 2005. Looking into tetrastyle atrium of VI.12.5 from north-west corner. VI.12.5 Pompeii. September 2015. 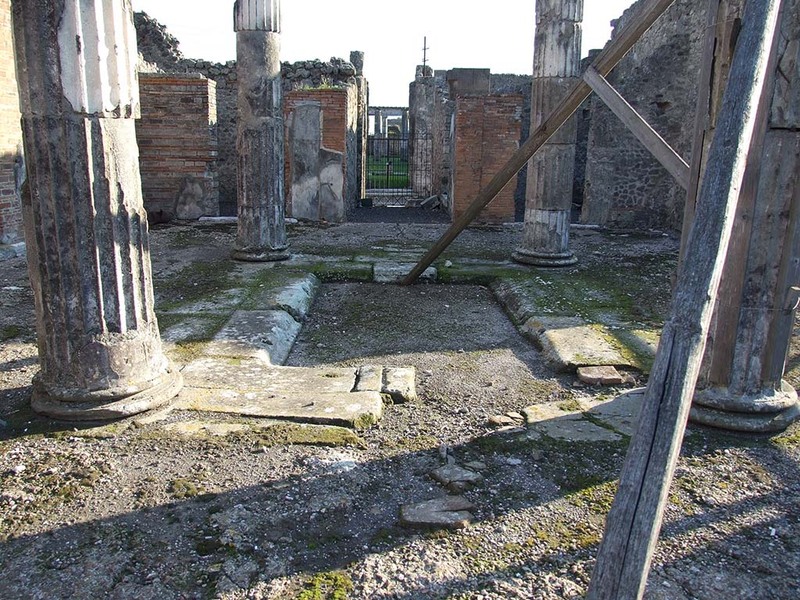 Columns surrounding the impluvium of the tetrastyle atrium, looking east to ala.
VI.12.5 Pompeii. December 2006. 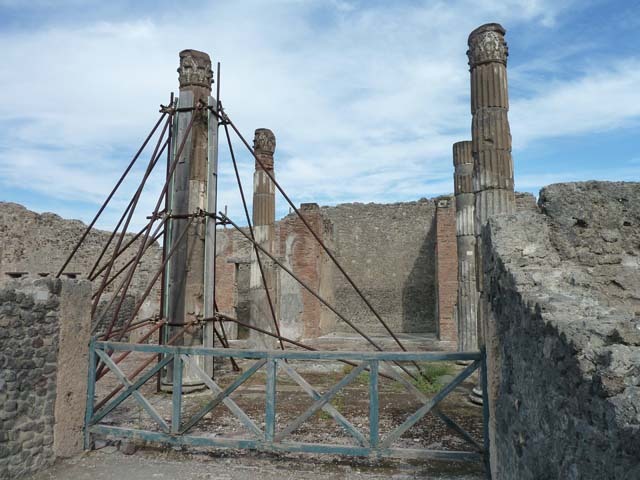 Columns surrounding the impluvium of the tetrastyle atrium, looking east to ala.
VI.12.5 Pompeii. December 2006. 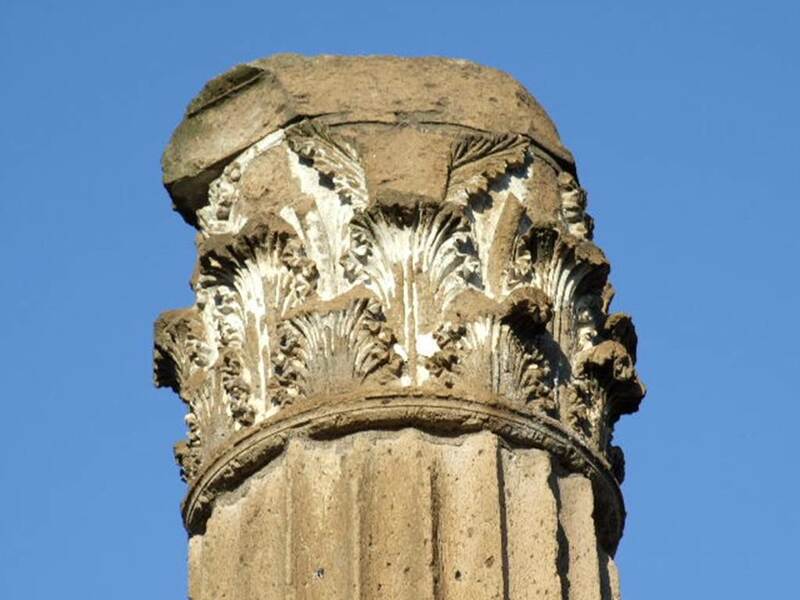 Detail of capital of column in the atrium. VI.12.5 Pompeii. December 2006. Two capitals on either side of ala to east of tetrastyle atrium. VI.12.5 Pompeii. December 2006. 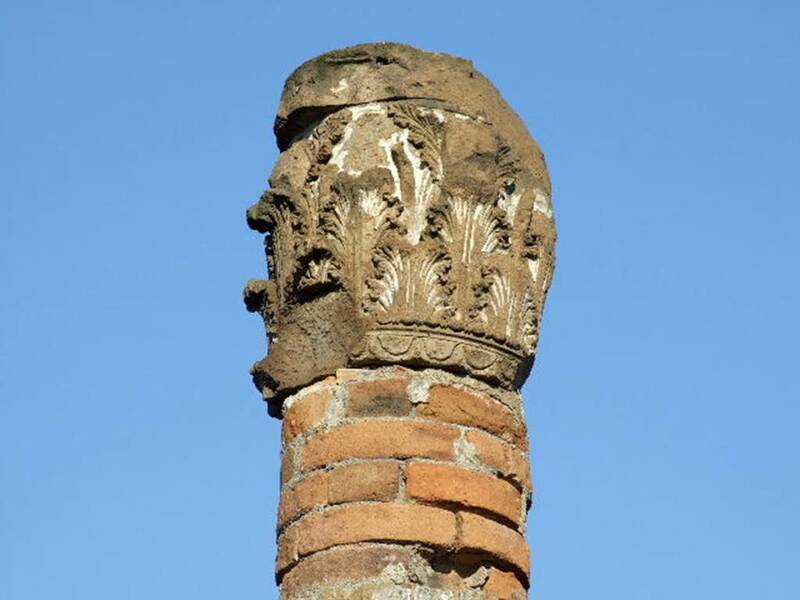 Detail of capital at the south end of the ala to the east of the tetrastyle atrium. 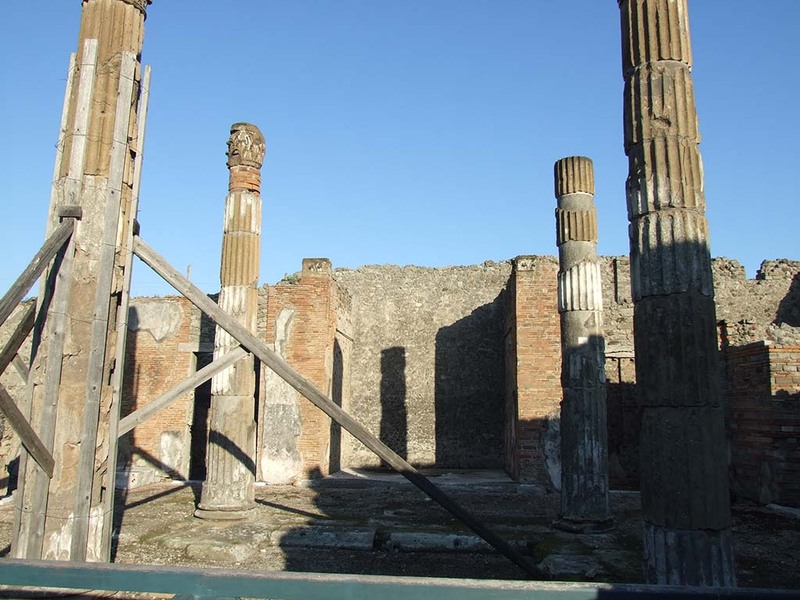 VI.12.5 Pompeii. December 2006. Detail of capital at the north end of the ala to the east of the tetrastyle atrium. 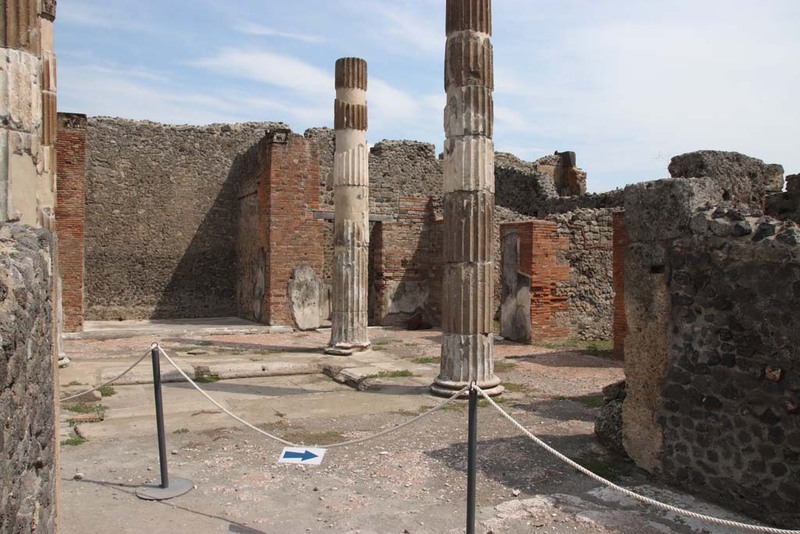 VI.12.5 Pompeii. December 2006. Looking east across impluvium in the tetrastyle atrium. 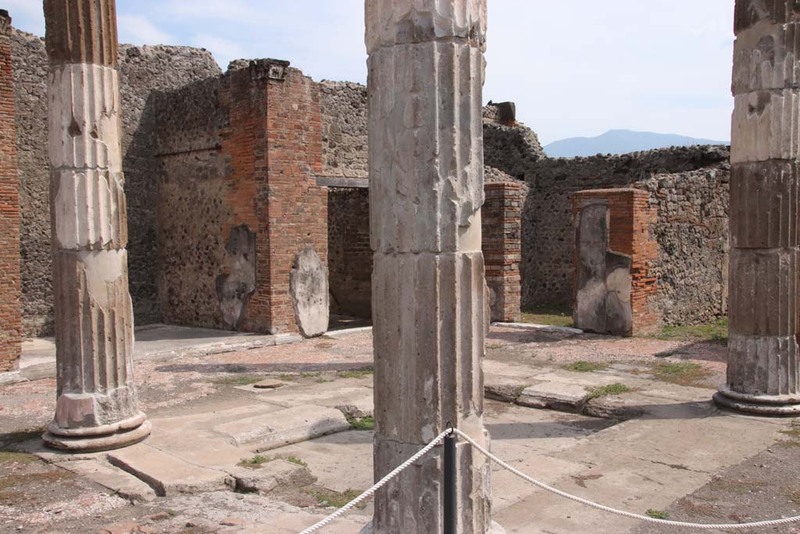 VI.12.5 Pompeii. December 2006. Looking north-east across atrium and impluvium. 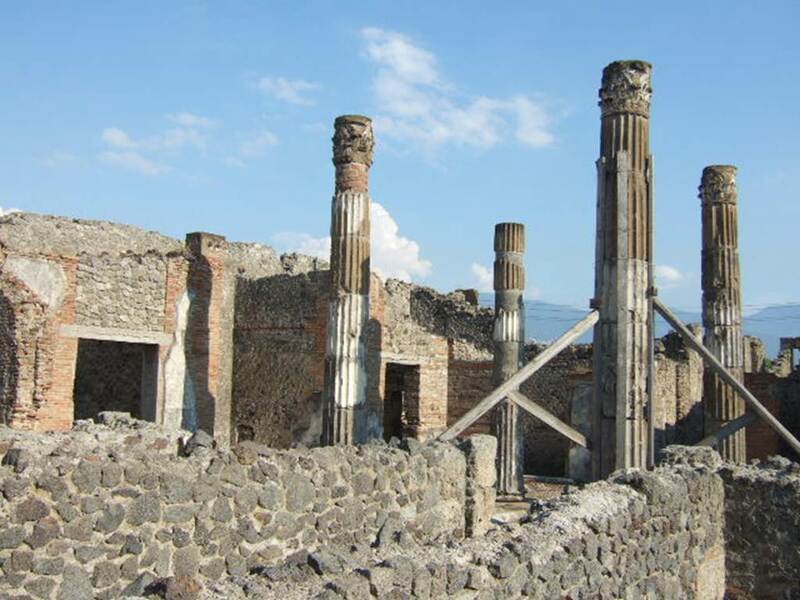 VI.12.5 Pompeii. 1968. Looking north across atrium and impluvium towards corridor in VI.12.2, on eastern side. VI.12.5 Pompeii. 1968. 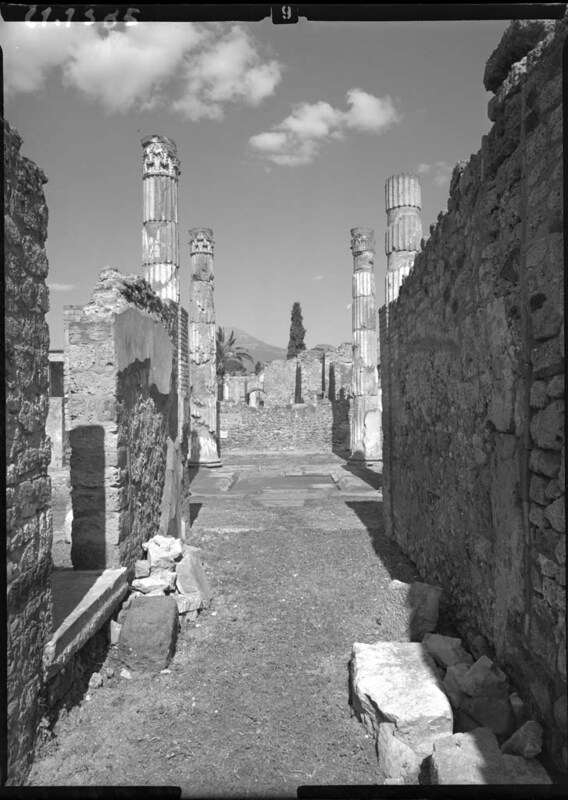 Looking north from atrium towards peristyle and exedra of VI.12.2 on left, and corridor on right. 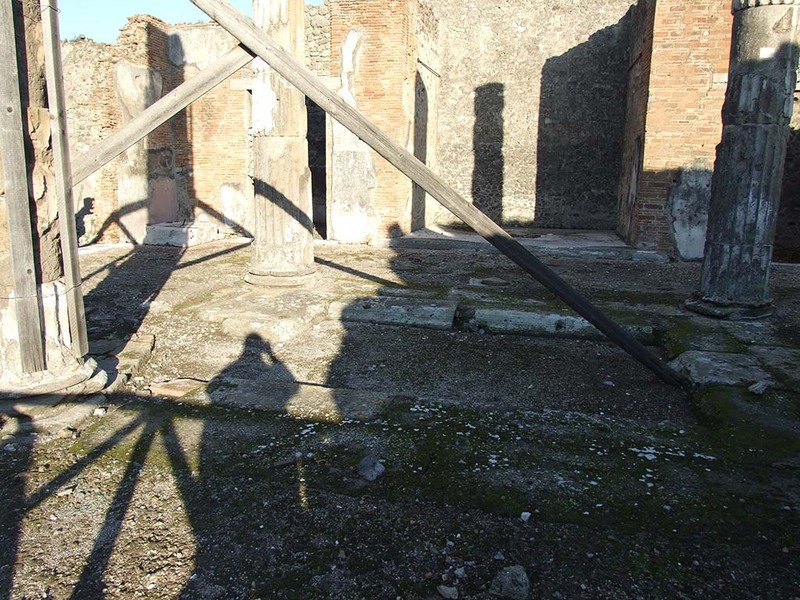 VI.12.2/5 Pompeii, but shown as VI.11.10 on photo. 1937-39. Looking east from VI.12.2 towards atrium of VI.12.5. 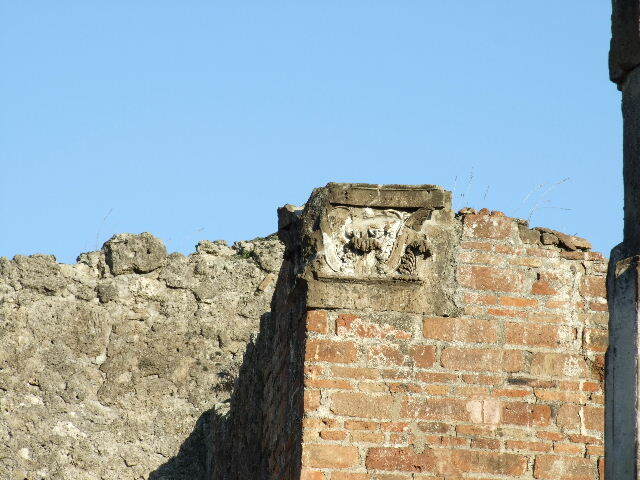 VI.12.5 Pompeii. Altar with Oscan inscription found in the atrium on 1st January 1831. Now in Naples Archaeological Museum. Inventory number 2550. 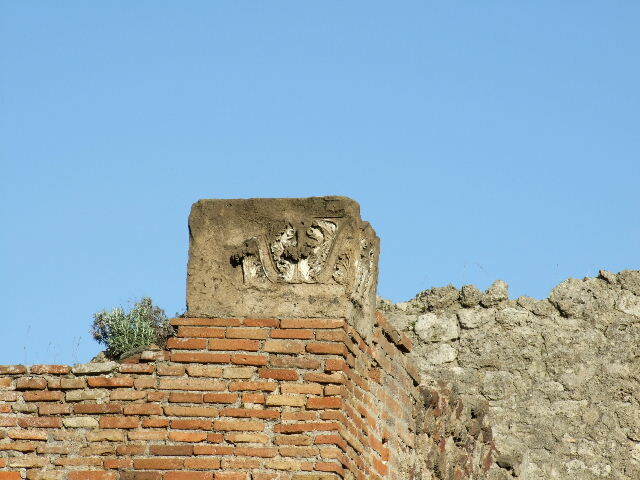 According to Fiorelli, this altar carried the name of “Flora” to whom it was dedicated, and a fragment of an inscription with the name of the Maio(?) Purio. See Pappalardo, U., 2001. La Descrizione di Pompei per Giuseppe Fiorelli (1875). Napoli: Massa Editore. (p.72, including a drawing of the inscription). VI.12.5 Pompeii. Iron stove with bronze lid. Now in Naples Archaeological Museum. Inventory number 264932. 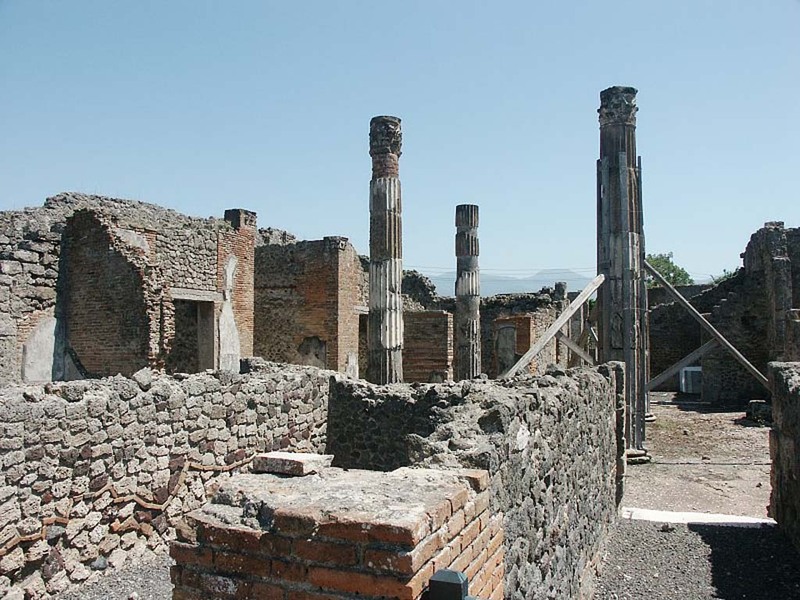 VI.12.5 Pompeii. 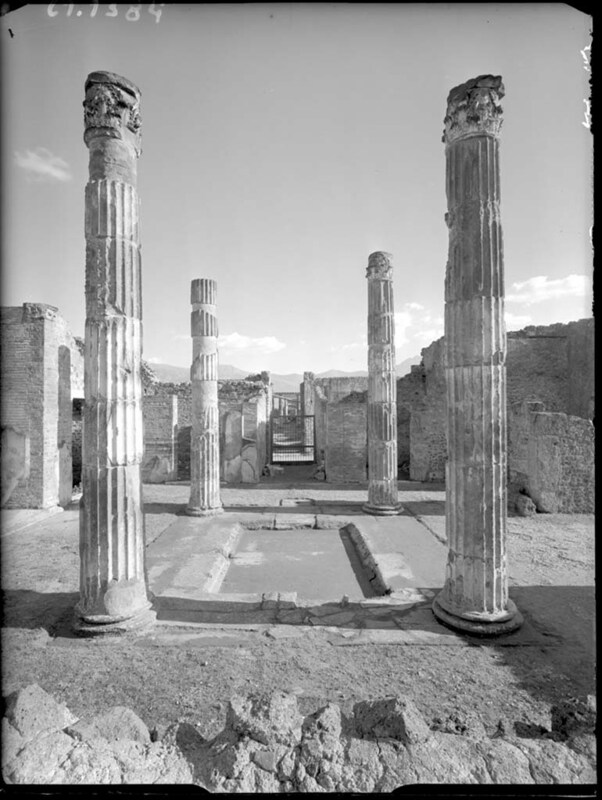 Found in VI.12.2/5 on 21st March 1831 in a room around the atrium of the four columns (VI.12.5). Iron stove with bronze lid. Now in Naples Archaeological Museum. Inventory number 264932. Bronze situla or bucket. Now in Naples Archaeological Museum. Inventory number 68859.